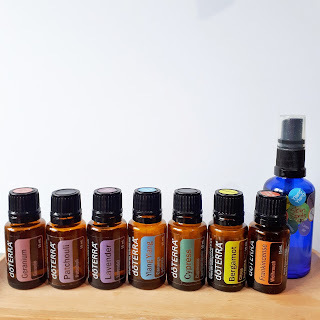 Since starting to use essential oils daily a year ago I've become increasingly aware of the amount of toxic chemicals we put in and on our bodies. 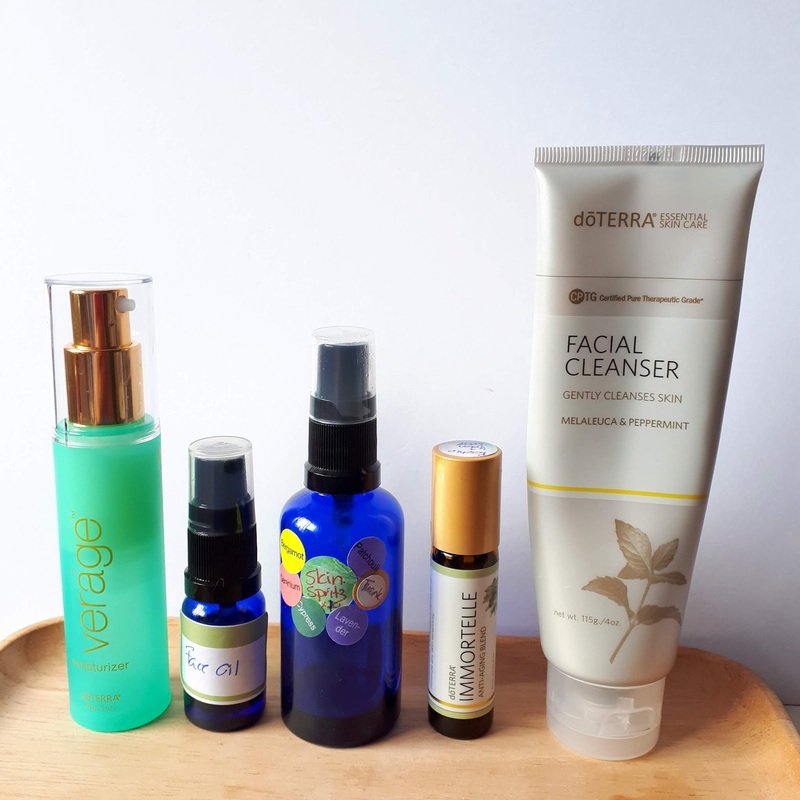 Our skin care, our cleaning products, our fragrance products (whether its an expensive perfume, air fresheners or candles) contain products that are harming our health. There is increased concern among medical professionals that many everyday products are related to increased rates of fertility issues, autoimmune disorders and the C word. Our skin is our largest organ and we absorb up to 60% of what we put on our skin and children absorb more than adults. So we should be careful about what we put on our skin. I am a bit of a skin care junkie. I love trying new anti-aging lotions and cleansers but over the last year I've completely overhauled my skin care regime. I've always had good skin but I've had more compliments about my skin in the last few months than I used to get. There's more to good skin than just your skin care. Genetics, protecting your skin from the sun and diet all play a role in how our skin looks. A lot of skin issues start in the gut so good gut health is important too. You can easily make many skin care product yourself but there are companies that sell skin care that's better for our health. And also better for the environment. Here's a You Tube video where I share my skin care. You can also watch it here. I'm using a combination of skin care products I make myself and DoTerra skin care. DoTerra has three main skin care ranges: the Essential Skin Care, Verage and HD Clear. Today I'm sharing my skin care routine and the best essential oils for your skin. To cleanse my skin I use the DoTerra Essential Skin Care Facial Cleanser in the shower in the morning. I wash it off with water. It leaves my skin feeling really fresh. After I get out of the shower I use a face spritz which contains Bermagot, Geranium, Cypress, Lavender Frankincense, Ylang Ylang and Patchouli. See below for the properties of these oils. If I don't have an oil, I just leave it out. I add about a 1/4 fractionated coconut oil and top up with Rose Water. My spray bottle is probably about 40-50ml and lasts me for ages. 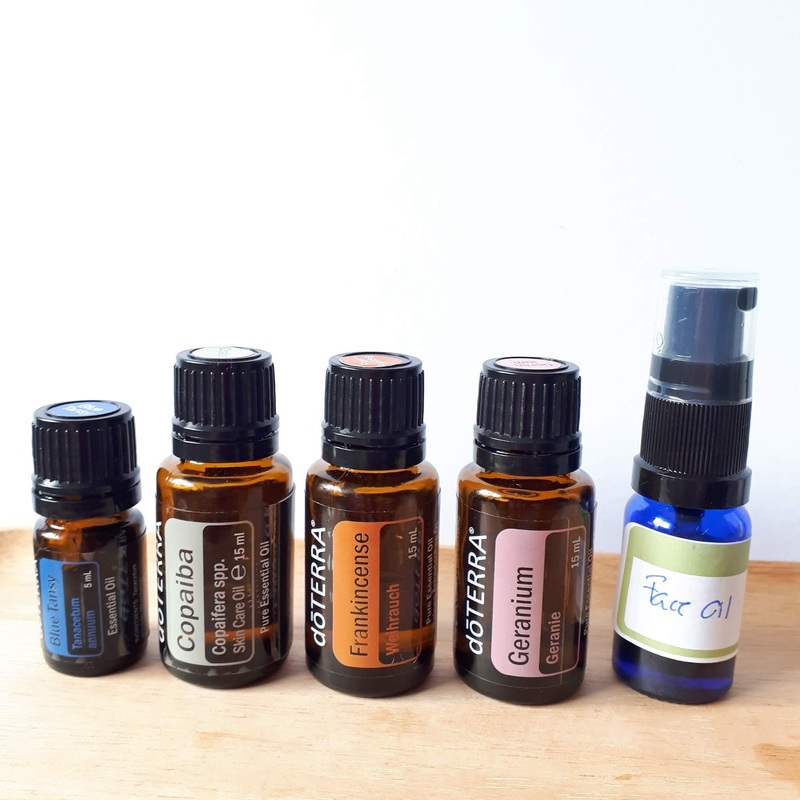 I use 10 drops of each oil, sometimes a bit less Frankincense (depending on how much I have left). I use the Verage Moisturizer on my face. This is a very light lotion and is perfect for my combination skin. If you would like more anti-aging properties or have drier skin, DoTerra does an Anti-aging Moisturizer and a Hydrating Cream and for those with oily and acne prone skin they do the HD Clear Face Lotion. 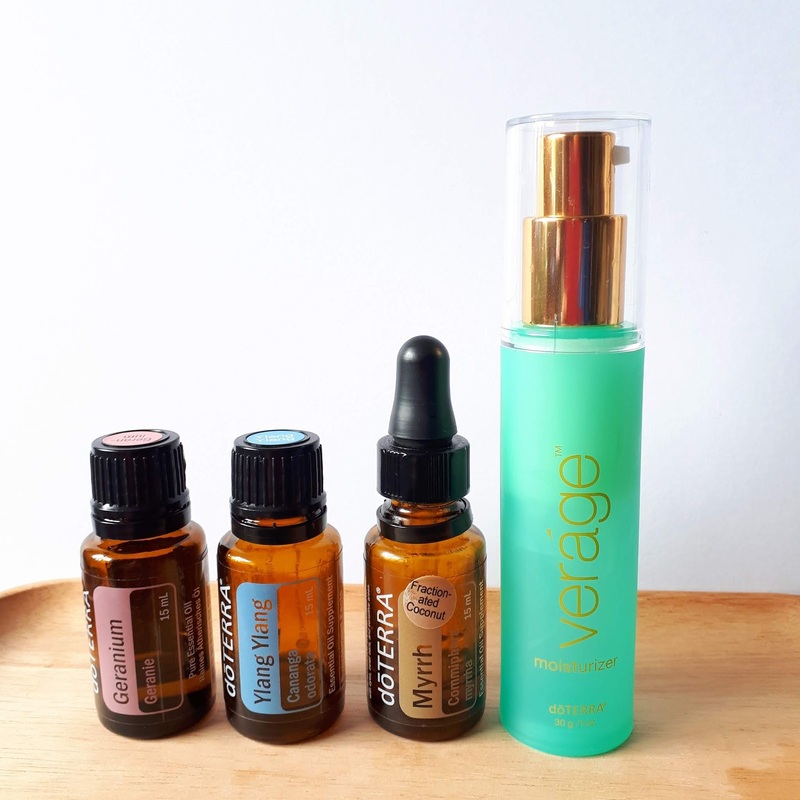 I use three pumps of Verage Moisturizer with 2 drops of Myrrh/Ylang Ylang/Lavender (I mix this in a small dropper bottle) and 2 drops of Geranium. I then do a quick swipe with the Immortelle Roller. Immortelle is a roller bottle which contains Frankincense, Hawaiian Sandalwood, Myrrh, Helichrysum and Rose. It's not diluted so I split it between two or three roller bottles and top up with a carrier oil. At the moment I'm using Rosehip oil. In the evening I use home-made make up wipes to remove my make up and cleanse my skin. First I put some fractionated coconut oil on my eyes to remove my eye make up (this works better than any eye make up remover I've tried) and then I use one of my make up pads to remove the rest of my make up. To make my make up wipes, I take a stack of large cotton pads and put them in a glass jar. In a small measuring jug I combine 1/2 table spoon witch hazel, 2 table spoons fractionated coconut oil, 2 table spoons water (I boil the kettle and let it cool but distilled water is better) and 1 table spoon of Dr Bronners Castille Soap. I add four drops each of Lavender and Melaleuca (tea tree). I pour this over the cotton pads. Each night I use one. They can sting your eyes which is why I use fractionated coconut oil to remove my eye make up. In the evening I moisturize my skin with a face oil. I've changed this oil a few times as I've acquired new oils. 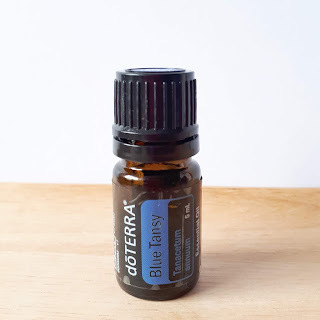 My current oil, which I love, contains: 10 drops Blue Tansy, 10 drops Frankincense, 10 drops Geranium, 5 drops Copaiba. I add half Rosehip oil and half Jojoba oil and use a 15ml glass bottle with a pump top. I use one or two squirts on my face every evening and one squirt on my hands before I go to bed. I've used this current blend for the last week and my skin feels much softer and smoother. The main difference in my latest blend is the addition of Blue Tansy which is the latest miracle ingredient to sweep through the beauty industry. Blue Tansy is anti-bacterial, anti-inflammatory, antihistamine, reduces the appearance of blemishes and according to Vogue 'will radically change your skin'. Many high end skin care products now contain Blue Tansy. As you may guess from the name, it's a blue oil and yes it may turn your skin blue for a short period. When I first got this oil at convention last month, I put one drop on my hand and rubbed it in. I didn't realise it would turn my skin as blue as it did and because it was neat it took a while to disappear. I put some hand cream on and washed my hand and eventually the blue colour disappeared. I tried a drop in my Verage moisturizer which left me with a slight blue tinge which disappeared after a few minutes. Using it as I do now in my Face Oil, it doesn't turn my skin blue at all although the Face Oil is blue. The first time you use Blue Tansy, use it in the evening to avoid having to leave the house with a blue tinge. to your skin. Blue Tansy is available in the US and will be released in Europe in August. Here are the main benefits of various oils,as it relates to skin. Some of these oils I haven't used yet. These oils all have other benefits too. Bergamot - anti-inflammatory, promotes clear, healthy skin, soothes eczema and proriasis. Cedarwood - astringent properties, acts as a natural toner to reduce pores and protect from bacteria, promotes clear, even skin tone, excellent for acne prone skin. Copaiba - supports inflammation so great if you suffer from acne. It also tightens the skin and helps reduce wrinkles. Also great to use to support pain and healthy levels of inflammation in the body. Cypress - great for circulation, reduces puffiness. Frankincense - reduces the appearance of fine lines and wrinkles, anti-inflammatory, reduces swelling, soothes skin irritations, supports cell regeneration, reduces redness and age spots and tones your skin. Geranium - balances out our skin whether its dry or oily while also supporting our emotional balance and balancing our hormones (I use this in my hormone blend too). It evens out skin tone and reduces redness. Lavender - is a powerful antioxidant, calms redness and blotchy skin, restores brightness, eases dryness, reduces appearance of aging. Melaleuca (Tea Tree) - great for cleansing your skin, reduces acne (I dab a drop on to any break outs I get), soothes skin irritations, balances oily skin. Myrrh - anti-inflammatory, antioxidant, healing properties, improves skin tone, reduces dullness. Patchouli - promotes a smooth, glowing complexion, reduces the appearance of wrinkles, scars and stretch marks, anti-inflammatory. Roman Chamomile - promotes smooth, healthy skin, relieves irritations, anti-bacterial and anti-inflammatory, reduces scarring and evens out skin tone. I haven't tried this oil yet but it's on my 'want' list. Ylang Ylang - minimises acne, regenerates skin cells and improves skin elasticity. The three oils below, DoTerra does as Touch rollers which means they're diluted with fractionated coconut oil in a roller bottle. These oils will be launched in Europe in August but are available in the US. Jasmine - reduces the appearance of skin imperfections and promotes a healthy looking, glowing complexion. Neroli - smoothes fine lines and reduces appearance of pores. Rose - perfect for dry or aging skin, minimizes appearance of scars, helps refine skin texture and tone. I do a swipe of Rose Touch over my cheeks every morning to minimise some redness from some tiny spider veins. 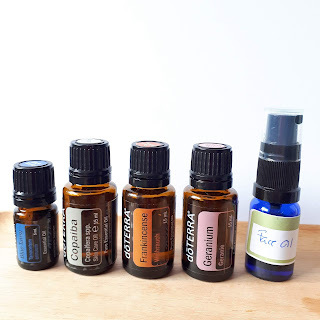 You can mix the oils with your face lotion or use a carrier oil such as fractionated coconut oil or look into other carrier oils like Rosehip, Avacado, Jojoba, Melon Seed or Argon. My favourite carrier oils for my face is a mix of Rosehip and Jojoba (Rosehip is a bit more expensive so I use half Rosehip and half Jojoba which is cheaper). 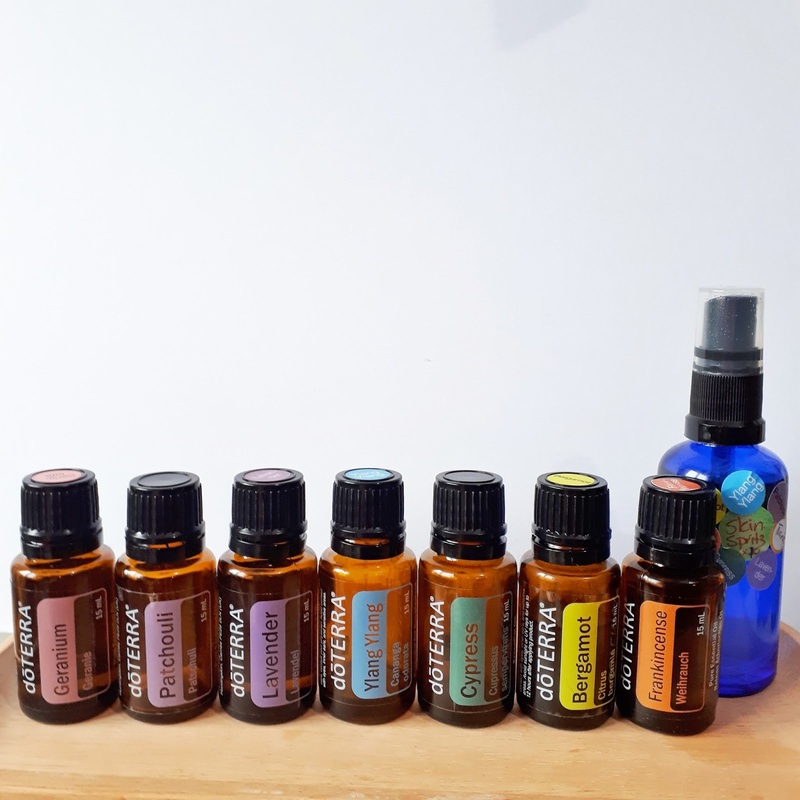 If you're interested in learning more about how essential oils can help you, please e-mail me on annikenallis25@gmail.com. 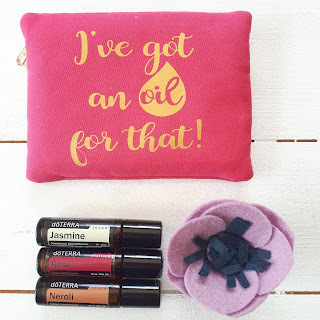 If you'd like to purchase some DoTerra essential oils or skin care, the best way to do that is to become a wholesale member, which means you get 25% off retail prices on everything you buy plus the opportunity to earn points back on what you spend, qualify for free products and get further discounts. You also get education and support from me and membership of our private Facebook group. There is no requirement to order monthly. Order what you want, when you want. 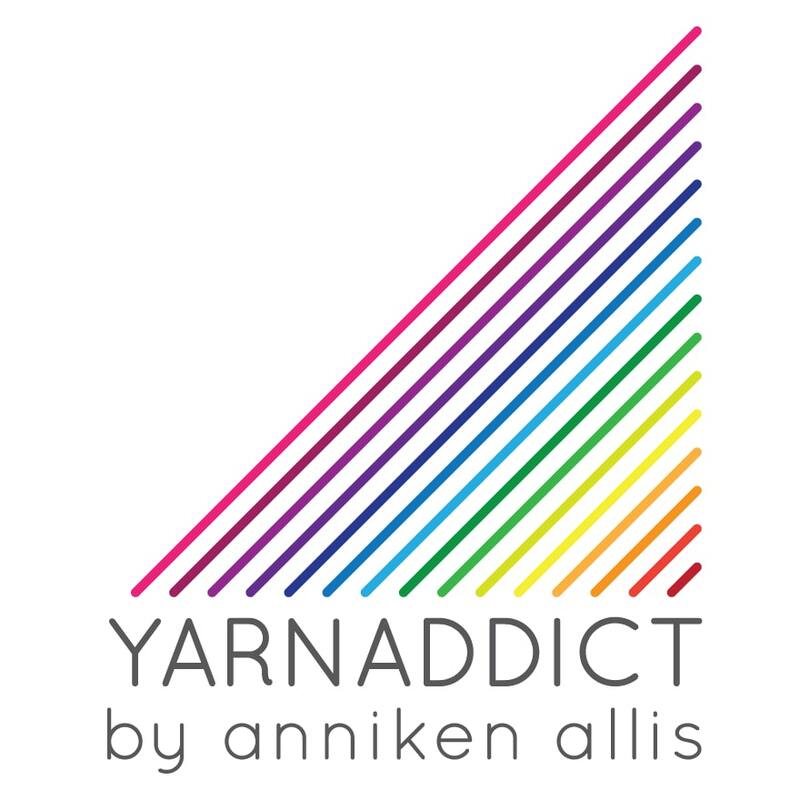 You can enroll here or e-mail me on annikenallis25@gmail.com to discuss your needs and the best way for you to get started. You can enroll with me wherever you live in the world.